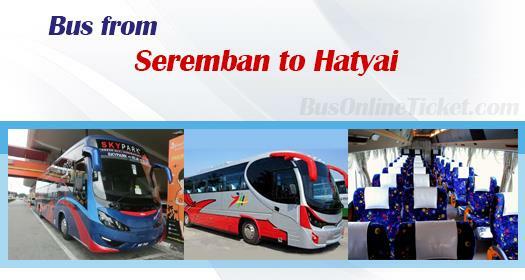 Bus from Seremban to Hatyai is most economical and convenient transportation option to travel from Seremban to Hatyai. Many locals from Seremban and travellers taking bus from Seremban to Hatyai can go directly to Hatyai from Seremban without entering busy city Kuala Lumpur and thus shorten the journey time. Why Take the Bus from Seremban to Hatyai and Not Go by Flight? The main reason is because flight fare is much more expensive than bus fare. Budget and commercial airline ticket fare is usually 2 times or 3 times more expensive than bus ticket fare, unless you manage to book the budget airline ticket during limited promotion period. Besides that, there is no direct flight from Seremban to Hatyai. Therefore, passengers need to travel to Kuala Lumpur transferring city bus or KLIA Express to the airport. Thus, taking flight is more time consuming than taking bus. Suasana Edaran Express and Trans MVS Express are the two operators supplying bus service from Seremban to Hatyai. The bus service from Seremban to Hatyai is only available in the morning and night session. The departure times for morning session are at 7:30am and 8:00am, while the departure times for night session are at 8:00pm, 9:00pm and 10:00pm. The duration for bus from Seremban to Hatyai takes about 9.5 hours, depending on the traffic condition. The bus fare is charged in a range of RM 70.00 to RM 75.00, depending on your selection of bus operator. Bus from Seremban will depart from Seremban Bus Terminal. Washroom break is provided at least once along the journey because all buses in Malaysia has no toilet available in the bus. To avoid all the hassle, time and money spent for travelling down to buy ticket from the counter, we advise you to book your bus ticket online through BusOnlineTicket.com. Book your bus ticket from Seremban to Hatyai now in BusOnlineTicket.com to have a peace of mind that you have your transport before travelling.